"Too often the force is still failing victims of crime, including domestic abuse victims," it said. Victim Support, an independent charity for crime victims in England and Wales, said the findings had "the potential to undermine public trust in the criminal justice system". An "unrecorded" crime is one that has been reported to the police but not recorded as an offence, and means the alleged crime may not have been investigated. 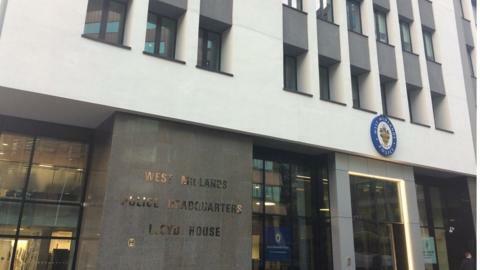 In 2017 HMICFRS said five out of six reported crimes were recorded by West Midlands Police but 38,800 crimes each year were not. It was re-examined for violent crime and sexual offences in 2018, with inspectors auditing a sample of reports from 1 March to 31 May. But they could not look at other types of crime because the force was updating its systems. Of the 2,176 reports of crime audited, 470 related to domestic abuse - of these 354 were recorded. Of those not recorded, 95 included offences classed as violent, such as common assaults, ABH, harassment and malicious communications. The report said: "We found several examples of attending officers letting down victims by simply not believing them. "Some incident logs contained closing comments that were completely different to the initial call and recorded no crime, without an adequate explanation." A read of social media will tell you just how bad things are. - Far worse than is reported here.